KIEV, Ukraine -- European diplomats appear close to negotiating the release of Yulia V. Tymoshenko, the former prime minister of Ukraine, whose imprisonment by the government under her political rival has strained ties with the West and threatened to derail a trade agreement with Europe scheduled for signing in November. Under the agreement, Ms. Tymoshenko would be pardoned by the rival, President Viktor F. Yanukovich, in exchange for a commitment from Ms. Tymoshenko to leave the country, at least initially by traveling to Germany for medical treatment. 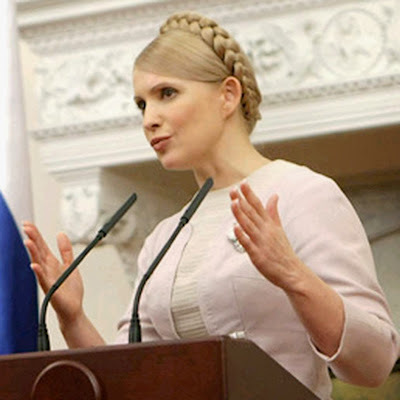 European envoys, led by a former president of the European Parliament, Pat Cox, and a former president of Poland, Aleksander Kwasniewski, made the offer to both the government and Ms. Tymoshenko, her lawyer and political ally, Sergey Vlasenko, said. In 2011, the former prime minister was convicted of corruption in what was widely considered a politically motivated trial, and she is serving a seven-year sentence. In an open letter released Friday, Ms. Tymoshenko wrote that she had accepted the offer to leave the country, though only for the sake of removing an obstacle to Ukraine’s conclusion of the trade deal with the European Union. That deal, called an Association Agreement, is a first step toward tighter economic relations and in theory eventual membership. In her letter, Ms. Tymoshenko vowed to return and remain active in politics. With the publication of this letter, “the ball is in his hands now,” Mr. Vlasenko said of Mr. Yanukovich. Mr. Yanukovich has not responded publicly to the European proposal. The deal for Ms. Tymoshenko’s freedom is the first sign of a thaw in a fierce political feud between Ukraine’s two most influential politicians. In addition to the 2011 conviction, the authorities have filed several additional charges against Ms. Tymoshenko, including one of murder in connection with the 1996 assassination of a lawmaker. She has denied all of the charges and appealed her conviction to the European Court of Human Rights. Mr. Yanukovich has nursed a grudge against Ms. Tymoshenko for her role in leading the street protests known as the Orange Revolution, which overturned his victory in a rigged election in 2004. In 2010, he narrowly defeated Ms. Tymoshenko in an election observers deemed free. In her letter from prison addressed to “my dear Ukrainians,” Ms. Tymoshenko, 52, wrote that she viewed integration with Europe as so vital for her country that she had asked the European Union to cross her release off a list of conditions that Ukraine would need to meet before signing, at a summit meeting scheduled in November. “I didn’t want the European future of my country to suffer for some reason, moreover because of my fate,” she wrote. Ms. Tymoshenko has said she needs surgery to treat back pain. In April she was beaten by guards, a routine event in Ukrainian prisons, her lawyer said. Because the Europeans did not drop their demand for her release, she wrote in her letter, she would be willing to accept the offer presented by Mr. Cox and Mr. Kwasniewski to leave Ukraine for medical treatment. European diplomats, acting on the axiom that Russia without Ukraine is just a country while Russia with Ukraine is an empire, have been trying to cut a deal with Ukraine before it agrees to join a Russian-backed customs union. They want a face-saving deal for Ms. Tymoshenko quickly.